Astarte Moon Inspirations a life closer to nature's rhythms : 20 ways to celebrate Yule with friends and family. 20 ways to celebrate Yule with friends and family. Below are twenty ways you can celebrate the festival of Yule. You can either do any of these with friends and family or on your own. 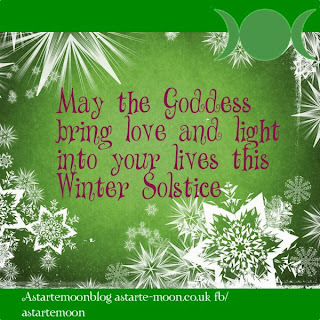 Celebrating the Solstice in this way is a wonderful way of recognising the wonder of our mother Earth and to let go of all that you do need and welcome positivity into your life as this turning point in the Wheel of the Year occurs. 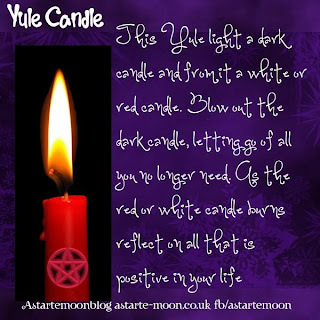 As Yule is a fire festival, light a Yule candle, with the stub of the candle from the previous year. Every day in December light the candle for a short while and meditate on all you have reason to be grateful for. Decorate your Christmas or Yule tree with items found in the natural world. Nuts, pinecones and holly are good examples I’m sure you can think of some more of your own. Decorate pinecones with glue and glitter as symbols of the fairies and put them on the Yule tree. 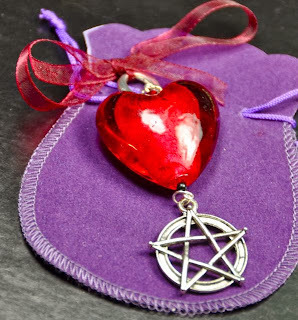 You can decorate your tree with items from nature as well as Pagan symbols such as the Pentacle. Bring nature indoors with boughs of holly and ivy. Use them to decorate your fire place or altar. Make your own wreath for your front door with evergreen leaves, berries and pagan symbols. As the wreath represents the wheel of the year you may like to include a representative of each season on it. Bring some mistletoe into your house to promote love and harmony. Feed the birds that are in need of food during these frosty months. Thread popcorn and cranberries onto string for festive bird feeders. These would also look great hung on your tree! Yule log ornament. Find a log that has fallen from a tree in your local park. Then when you bring it home you can have lots of fun decorating it with red a green colours. You can use holly and ivy or red and green tissue paper and pipe cleaners to make a really lovely display. If you can’t find any wood near you then use the inside of paper towel painted brown. Make some of your own Yule greeting cards. You can use the ideas here or send these as e-cards to your friends and family. For personalized wrapping papers, cut an apple in half to reveal it’s pentacle on the inside, then use poster paints on plain tissue paper to make colourful pagan wrapping paper. 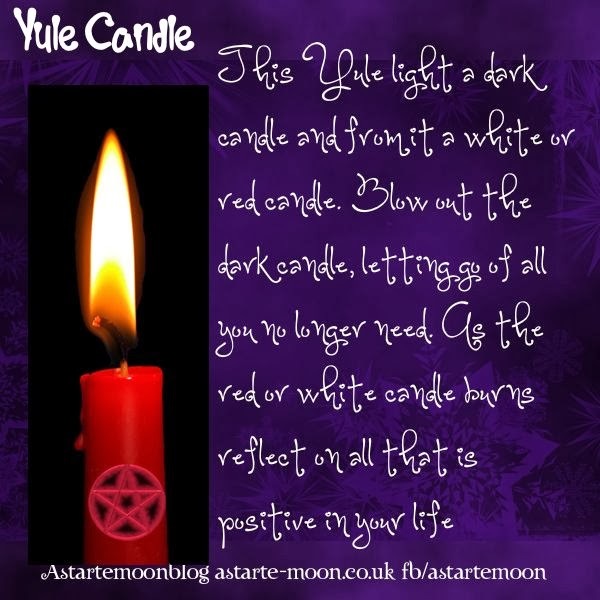 Light a dark coloured candle of the eve of Yule to represent all that you wish to let go of. From it light a white candle to represent all the positive events in your future. Once you have lit the second candle, blow out the first, letting go of your past and all that you no longer have need of. Burn the white candle during the eve of the Solstice to remind yourself of all the good things yet to come. Make a sun ornament from yellow card and paper tissue. Meditate on the importance of the energy of the sun, think about how the days are going to get longer from today and the sun return to warm the earth. Watch the sunrise on the morning of the Solstice, praying to the strength of the sun to empower you with its strength. Spend time with family and friends during the day or evening of Yule, giving thanks to our Mother Earth for all that she provides for us. Make welcoming jingle bells. String small bells from yellow ribbon and hang them in a doorway where they will make a gentle ring as someone walks by. You can buy small bells from most craft shops. Every time they ring you will be reminded of this wonderful festival and the light and sound bestowed on our Mother Earth. If you have any sacred sites near you, visit one such as Stonehenge where you can see the sun rising as our ancestors once did so long ago. Go ‘wassailing’. Visit your friends and neighbours bringing with you a small gift or food and drink such as mulled wine or cider. Make your own Yule pot pourri to give your house a wonderful seasonal scent. This mix will keep well in a glass jar until needed, it would also make a lovely Yule gift for friends and family. Make herbal sachets with herbs that you enjoy the smell of or are appropriate for the time of year. Mistletoe, balsam, and fir are good choices. 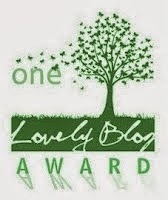 You can hang your sachets on your tree, around your house or give as a lovely Solstice gift. How will you be celebrating Yule this year?